Serving Our Community for Over 130 years! We are a congregation of the Evangelical Lutheran Church in America (ELCA) and the Saint Paul Area Synod. As you explore our website we hope you discover who we are and the mission we share as a faith community. We invite you to join us! Trinity’s beginnings date back to 1887 when Swedish immigrants originally gathered to center their life in Christ and serve God’s world. Each successive decade has brought new challenges, new opportunities and new dreams. Today we are community where people come from all walks of life to worship weekly, pray daily, study scripture, serve God’s world, walk as spiritual friends, and give generously to the mission we share as disciples of Jesus Christ. Trinity began as an immigrant congregation and in many ways we still are an immigrant congregation. People no longer come from Sweden, Norway and other parts of Europe; instead they come from places like Blaine and Anoka, St. Paul’s Eastside and North Minneapolis, and of course North Branch and its surrounding communities. They also come from out state Minnesota, Iowa, Wisconsin, North Dakota, South Dakota and beyond. People still come searching for a spiritual home, a place of belonging, and for meaning and purpose. Whether you are a newcomer to North Branch or someone who has resided here for many years, we invite you to come. Be a part of this community that gathers around Jesus. We hope that you will perceive that we are a Spirit-led community that continues to discover that God is up to something in our church and the world. 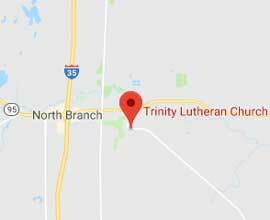 We hope that you will experience that we are excited by the energy, convictions and hopes that are alive in Trinity Lutheran Church. Most of all we want to welcome you more personally because we truly believe God is calling us to be a welcome place of grace where everyone matters and where everyone has something to offer. Jesus Christ continues to transform our lives and our congregation. Come be a part of what God is up to!